A beautiful rich complex pink with a hint of lilac. 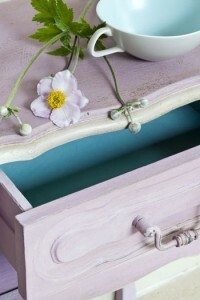 It's a sophisticated colour used in its full strength but with Old White added it stays an interesting colour and without being too 'cupcake'. Henrietta painted on a small French side table with Country Grey on the mouldings and Provence in the interior. To give it depth a dark wax was used in a few places.